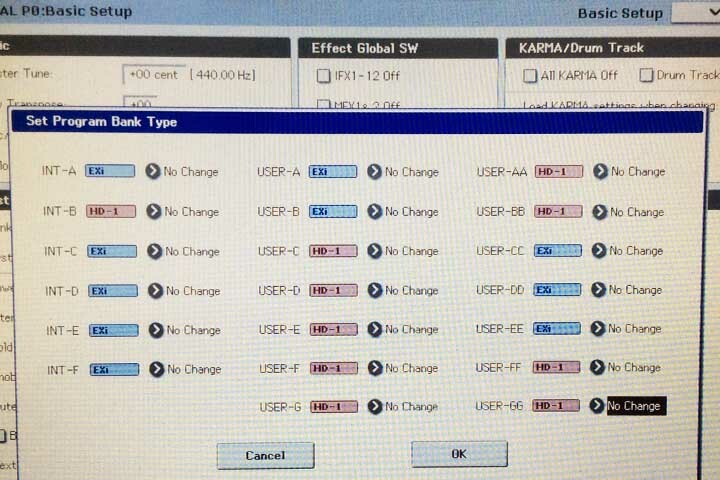 Korg Forums :: View topic - Why is bank/program handling so retarded? Why is bank/program handling so retarded? Posted: Fri Oct 26, 2018 6:24 pm Post subject: Why is bank/program handling so retarded? I own the Korg Kronos X for a couple of months now and I love the sound so much. I just can’t undestand why loading and organizing programs is so retarded on this amazing machine. I purchased a lot of EXs libraries and I wanna make a combi using sounds from different libraries. The thing is that these libraries get loaded into U-G bank therefore overwriting previously loaded programs ( which I already use in my currently making combi). . I tried moving it to a different bank as i don’t care about the combos of those Programms. I understood that moving programs will break the combos. I want to make my own so it’s fine. But I can not copy or move. I tried saving a the whole U-G to a USB then load it back into UU-AA.. but it says no readable data. Why the heck can’t I just do load append like on the extreme and it will just be there?? This is the only dealbreaker for me. I mean being able to organize sounds is the most important thing for me. When you face complexity, its better to crack the books and get knowledge, and map it out. Before you jump in. If you study it, the banks and loading has limitations. 7 years ago , it seemed ok.
And Korg has not solved this limitation in 7 yrs. Some good news- I think there are some PC tools to help you with the challenge. Pay close attention to every step of the video. I think this is the video i used to get a grasp on the matter. I think i recall a part about dialogue box for selecting which combi or program bank you want to load into. Default is UUG/UG but the disk mode dialogue box lists that with the option to change it. Maybe you saw that box of info but did not realize it was possible to touch the bank listed and have it open a screen of all the other banks for custom loading options. Posted: Fri Oct 26, 2018 11:21 pm Post subject: Re: Why is bank/program handling so retarded? I understood that moving programs will break the combos. I want to make my own so it’s fine. But I can not copy or move. I tried saving a the whole U-G to a USB then load it back into UU-AA.. but it says no readable data. You can copy any bank to any bank destination. This is a synth engine bank, ie AL-1, MS-20, PolySix, STR-1, CX-3, MOD-7, EP-1. What has started some confusion is the inclusion of SGX-1/2 pianos. Those should be samples in the ROMpler, right? Well, SGX uses modelling, along with samples, so it is an EXi engine. But, the usual rule of thumb is, if it is sample based, it is an HD-1 program.......except for SGX pianos. Got it? Go to GLOBAL - BASIC page. 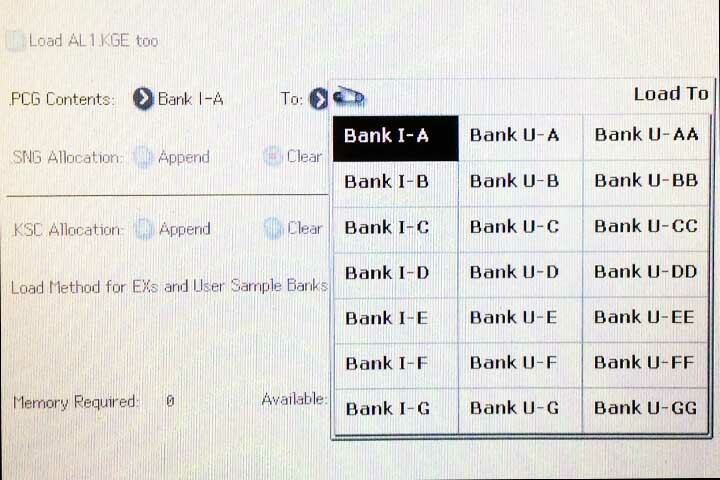 From the dropdown menu, select SET PROGRAM BANK TYPE. That's it; select HD-1 (samples) or EXi (synth/modelling). There was a long thread on this topic a few years ago. In that thread, I wrote and posted a detailed proposal for an implementation approach that would maintain compatibility with PCGs and MIDI sysex. There are two options, one yielding 70 program banks, and one for 128 program banks. From the pace of updates, I suspect the Kronos is finished in terms of development. Maybe someday there will be a successor instrument that will take a more modern approach to data storage. It could definitely be easier! There's plenty of resources on the web and these forums discussing some different techniques for managing the banks. If you're just loading Programs, it's pretty easy to manage on the Kronos directly, but if you're working with Drumkits, Wave Sequences or Combis, it's definitely easier to use either the Kronos Editor or PCG Tools. After many years, my technique is simple: most of the commercial libraries load into the same Program/Combi/Wave Sequence banks as one another, so I keep these clear for loading and trying new libraries. When I buy a library, I load it as per normal, then use the editor to consolidate them into the other banks. Most of the time, the libraries don't use all the Wave Sequence or Program slots in a bank, so it's easy to condense them down. Once I've done that - and this bit is really useful - I save my PCG. I can then load Programs as needed, but always keep the necessary wave sequences loaded with the new, corrected references. i find this works really well for my needs.